GN oilfield decanter centrifuges can be used in different applications for handling drilling mud for solids control and drilling waste management. How to set up bowl speed for decanter centrifuge for drilling mud? Barite Recovery: Operator can run the centrifuge with G foce at range from 700-1000 G, and run the 14 inch decanter centrifuge at speed around 2000 RPM. High Gravity Solids(HGS) Separation:Operator can run the centrifuge with G foce at range from 1000-2000 G, and run the 14 inch decanter centrifuge at speed around 2500 RPM. Low Gravity Solids(LGS) Separation:Operator can run the decanter centrifuge with G foce at range from 1800-2300 G, and run the 14 inch decanter centrifuge at speed around 3000 RPM. How to asjust the speed for decanter centrifuge? The method to set up bowl speed for decanter centrifuge normally have three ways, one is to USE the VFD control system to adjust the frequency for the motors to control the speed for the decanter centrifuge, second is to use Hydraulic driven system to adjust the bowl speed and differential speed.Third, to change the centrifuge speed is to use different sizes of pulley and belt to change the speed. GN offers decanter centrifuge for all above types to allow users to use the decanter centrifuges for different applications. Decanter Centrifuge Feeding Pump speed and capacity. 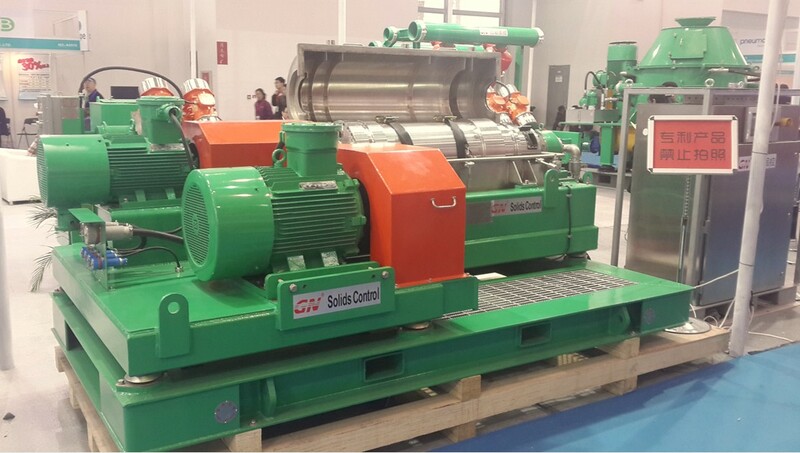 To feed the GN 14 inch GNLW363 Decanter centrifuge, normaly we recommend to use GNG30-7.5 screw pump.The GNG30-7.5 screw pump is a positive displacement single screw pump, the capacity of the pump depends on the speed or the motor, the motor transfer the speed thru gearbox to the pump. For example, the ration of the Screw pump is 6/1 so if the pump motor run at 60HZ, that means the motor run at 1750RPM and the pump will run at 291RPM. And if the decanter centrifuge feeding pump run at 291 RPM with capacity at 30m³/h. And if adjust the VFD to run at 30HZ, the pump speed will be half capacity, around 15m³/h.